Igloo Products Corp., the industry leader in cooler manufacturing, today announced the initial product offering in its collaboration with LiddUp, LLC, the cooler LED lighting system provider as seen on ABC’s reality television series, Shark Tank. The Party Bar™—a new, highly accessorized mobile cooler designed for indoor/outdoor at-home entertaining— will launch in early spring 2015 and be the first cooler to feature LiddUp’s patented LED interior lighting system. Part cooler, part bar cart; the Party Bar has got you covered for every entertaining occasion—from holiday parties with the whole family, to large scale tailgating for the big game, to low key backyard cook outs with the neighbors. “Part cooler, part bar cart; the Party Bar has got you covered for every entertaining occasion—from holiday parties with the whole family, to large scale tailgating for the big game, to low key backyard cook outs with the neighbors. Consumers will be thrilled when they see this sleek, versatile cooler in stores. The Party Bar doesn’t make you trade quality and functionality for something that looks fabulous in your home,” said Igloo product manager Lisa Silva. The Party Bar—powered by LiddUp— provides 360 degree interior lighting using 16 water-resistant, heat-free LEDs built directly into the cooler. “This gives each and every partygoer the ability to find what they’re looking for quickly and easily. We’ve all been there—nighttime, pitch black, digging through a cooler sloshing around trying to find a particular drink. With the Party Bar, LiddUp and Igloo are making ‘frozen handed and frustrated’ a thing of the past,” said Jayson Sandberg, Inventor and Founder of LiddUp. 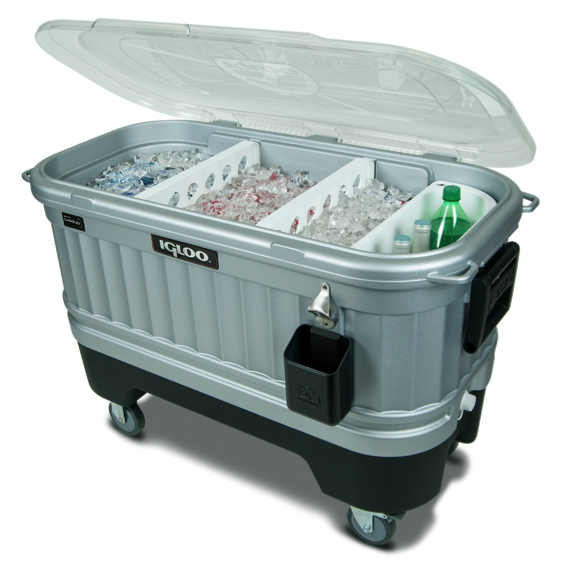 The fully insulated cooler is housed in a detachable base with heavy-duty, lockable casters allowing for easy transport of the Party Bar to the center of the action, while the locking feature keeps it safely in place. 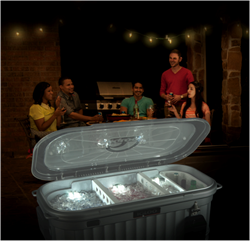 The translucent lid and LED lighting tempts partygoers with the cooler’s contents so they can select their favorite libations with ease at any time of the day or night. The Party Bar—powered by LiddUp—will be available at select retailers in early Spring 2015 with an MSRP of $199.99. Igloo and LiddUp will be unveiling the Party Bar to the public for the first time at the 2015 Sports Licensing and Tailgate Show on Jan. 14. The Show—held annually in Las Vegas—is the premier event for brand owners, licensors, licensees and retailers interested in sports licensed products, hosting more than 300 exhibitors and thousands of retailers each year. To schedule an appointment with LiddUp during the Sports Licensing and Tailgate Show, contact Taylor Gwiazdon at Taylor(at)LiddUp(dot)com. Igloo Products Corp. is a Texas-based international designer, manufacturer and marketer of coolers, outdoor products and housewares. Founded in 1947, Igloo is responsible for originating the cooler category and remains today the number one cooler brand worldwide. For more than 65 years, the Igloo brand has been synonymous with quality, durability and innovation. Offering more than 500 different products, Igloo coolers are sold by more than 110 thousand retailer storefronts around the world. For more information, visit http://www.igloocoolers.com. LiddUp, LLC was founded by Jayson Sandberg, who came up with the idea of a light-up cooler while camping, and was first featured on ABC’s reality television series Shark Tank, with business partner Taylor Gwiazdon, in April of 2013. The LiddUp brand has four issued patents on the unique interior lighting technology. LiddUp pioneered its cooler design to use LEDs, as an efficient and heat- free light source. The goal of the brand is to offer an innovative product with a practical design for use at any time, day or night. To learn more, please visit http://www.liddup.com or contact the LiddUp Team at liddup@liddup.com.